Mesotherapy with biomimetic peptides and hyaluronic acid! Larger quantity (5 ml) at the best price. *Hair growth stimulators with active ingredients: biomimetic peptides and hyaluronic acid – 70 eur. *The introduction of preparations with a rifle for FREE. *Introduction of concepts in microadaptive mesotherapy for FREE. *Before the procedure for oxygen therapy with hyaluronic acid and peptides, we recommend microadaptive mesotherapy, which will increase the effect and result! Mesotherapy with Dermaheal product from CAREGEN Company, the New Generation in the World with biomimetic peptides! Unique composition, more than 58 active substances: biomimetic peptides, purified hyaluronic acid, vitamins, minerals, amino acids, antioxidants. Dermaheal SB: Bleaching of pigment spots, prevention of hyperpigmentation and regeneration, dark correction of rites in the swelling zone, couperose correction. 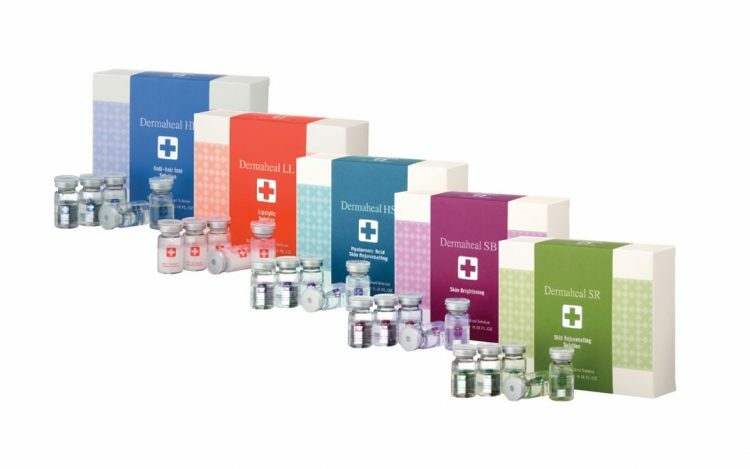 Dermaheal LL: Reduction of localized fat deposits in the body: hands, clubs, abdomen, knees, thighs and the back. Dermaheal HL: intensive hair loss products, strengthens thin, shattering and dyed hair, revitalizes and nourishes the hair bulb, restores the vitality of the scalp. How many procedures will be required? Stage 1: 2 generations/per week the first month; Stage 2: 1 generations/per week second month; Stage 3: 1 generations/2 weeks the third month; Stage 4: 1 generations/2 month. Stage 1: 1 generations/month; Stage 2: 1 generations/2 weeks the second month; Stage 3: 1 generations/month the third month; Stage 4: 1 generations/ 2-3 months. The high standards of manufacturing and safety of products have been certified by ISO 9001 and ISO 1400 and CTFA. More than 70 biomimetic peptides and 20 growth factors were registered with the PCPC (Personal Care and Products Council). The world’s leader in the development and synthesis of growth factors and biomimetic peptides, cytokines, active nutrients, hormones, research and development. Peptides are the most promising ingredients in pharmacological and cosmetic products. In 1952, the technique of mesotherapy was first applied by French therapist Michel Pistor. It is a minimum invasive technique, which is widely used in the entire world in treating various health problems. This is a direction of aesthetic medicine due to which the problems of alopecia, weak hair, hair loss, acne, cellulite, stretch marks, loose skin are solved and skin wrinkles are eliminated by using various effective materials – vitamins, minerals, amino acids and hyaluronic acid. The doctor selects the specific combinations of active materials for problem solution and due to microinjections the material passes to mesoderma (the middle layer of skin). Henceforth, the Era Esthetic laser dermatology clinics uses French company’s “Biophymed” mesotherapy gun U225 – the most modern and popular mesotherapy gun. (more information below). Scars (post-acne or after traumas). Relative – usage of anticoagulants. Hyaluronic acid is one of the most important components of our skin. The external view of skin depends on its concentration in derma cells. Saturated with hyaluronic acid, skin looks young, elastic, smooth and lips looks tight and full. Approximately at the age of 25-30, the amount of hyaluronic acid starts to decline in derma – each year we lose 3 per cent of hyaluronic acid and notice gradual manifestation of skin ageing. The direction of mesotherapy antiage is focused on the restoration of hyaluronic acid concentration in skin. When performing mesotherapy, hyaluronic acid passes to skin by the way of microinjections. Injected hyaluronic acid stimulates fibroblasts, activates collagen and elastin synthesis, initiates synthesis of own hyaluronic acid, improves regenerative features of skin, slows down the ageing process. In this way, due to mesotherapy the skin tonus and elasticity is restored and skin obtains healthy colour. Subject to skin problem, skin moisturizing and stiffening is performed, skin wrinkles are corrected, prophylaxis of skin “droop” is performed, skin radiation, antiage – skin ageing, mesolight – skin brightening, mesolifting – skin stretch procedures. The procedures are performed in the areas of face, neck, decolletage, hands and forearms. The doctor selects mesotherapy healing cocktail for active revival of hair and their strength, that consists of vitamins, microelements, amino acids, growth factors individually for each patient in respect of problem, the reason of problem, the status of hair and head skin. Due to microinjections, the preparations pass to the hair follicle. Mesotherapy improves head skin microcirculation, provides hair follicles with required substances and microelements. Subject to the problem, the course of 7-12 procedure every 7 days is performed. Mesotherapy is one of the most effective solutions of cellulite. Cellulite usually appears at the age of 25-35 and progresses gradually. There are various mesotherapic solutions for fight against cellulite. Subject to the type of cellulite, the cocktail of active materials is selected acting on the causes of cellulite and acting on already visible problem: Stimulates lipolysis (decomposition of fat), acts on precapillary sphincters and vessel walls (stimulation of liquid drainage), fibrosis (fibres that cover fat cells and, thus, form “orange peel” effect) also active materials act as prophylaxis in view of cellulite progression. Stage 0: visually invisible even by taking the skin into wrinkle. Stage 1: cellulite is invisible when standing or laying. Taking skin into wrinkle, the “orange peel” structure can be visible. Stage 2: the cellulite becomes visible when standing up, whereas in the laying position it is invisible. Stage 3: cellulite is apparent in both standing and laying positions. The number of procedures varies subject to the stage of cellulite. Before the procedure, during the cost-free consultation the doctor will consider the problem, cause of problem, clinical form, and will compose an individual schedule for the solution of problem. Usually, during exacerbation, 4-7 procedures are performed every 1-2 weeks, and later 2-4 procedures per year are recommended for prophylaxis. The duration of procedure – 20-45 minutes. Local in skin without passing to bloodstream, therefore does not cause any systemic side effects. Physiological – when performing mesotherapy the skin is not only provided with required materials but also the natural mechanisms of skin restoration are stimulated (stimulation of fibroblasts, synthesis of increased collagen and elastin). Successful combination with other aesthetic procedures (peelings, laser, light therapy, contour plastic). U225 mesogun created by French company is the most modern gun in the market. 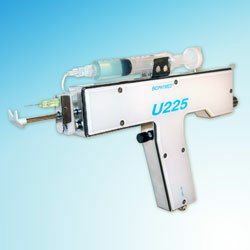 U225 mesogun is fitted with controllable functions that can fastidiously control the depth of injections and perform precise and fast injections – up to 500 per minute and 8-9 per second! Why this gun is so popular? – U225 gun syringe is separated from needle. This is another distinctive feature of gun – during injection only needle moves backwards and forwards, thus, providing delicacy and avoiding pressure power causing pain. 2. Due to extremely high number of injections, the skin is additionally stimulated (stab stimulates fibroblasts responsible for collagen synthesis), the amount of injected material is considerably higher and distributed more precisely and evenly. Due to these stimulation features, the procedures become more effective and also completely painless. 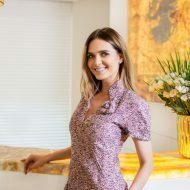 of mesotherapy procedure is compared to the effect of fractional laser, during the procedure the skin is additionally injected with various cocktails and hyaluronic acid. Injections with mezogun U225 are performed to all areas of body starting from traditional areas, for example, abdomen and thighs, as well as most sensitive areas – face, head skin.